Bernie will be a special guest on a local radio rock special tonight on GTFM, you can get the links on our page reviewing the new album. Copies of the CD to be won too. Thanks to Andy Fox. 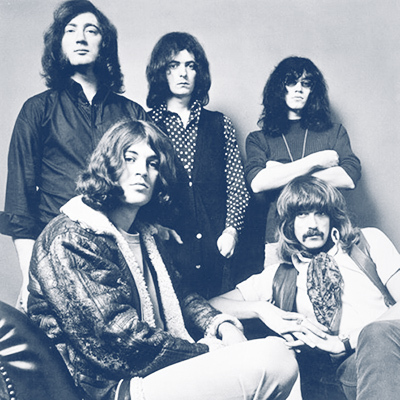 Above: Deep Purple Now (looking like they’re busy nicking scrap metal!) and Then (1969 – yes I know we thought the In Rock sleeve pics were taken in 1970, but it increasingly looks like they were shot the previous year). As is traditional at DTB during this time of year, we’re gazing into the Slaves & Masters sleeve to see what the next twelve months might hold for Deep Purple fans. Any anniversaries to celebrate? Well it’s the 45th Anniversary of Mk 2 for starters, which is quite something (especially for us oldies who were around at the time), and also the 40th of Burn. Still not feeling your age? Then try the 30th anniversary of the reunion on for size. 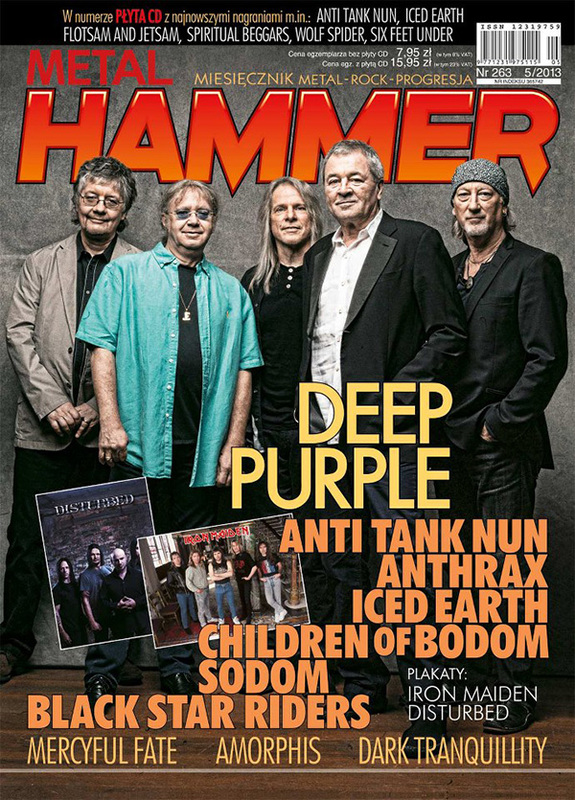 More importantly for the band, it will be 20 years since Steve Morse joined Deep Purple – his first gig with them being in November 1994 (though it was a little later that the UK first got to see the band). Time is all we have, as IG put it on the last album. Will they be inspired to bounce back with a quickish follow up to Now Then? They do all seem to want to work with Ezrin again as soon as, but perhaps a little optimistic to see them back in the studio just yet. Otherwise it looks like business as normal with dates already appearing (see our date sheet). This will certainly be the year in which the shake down of the long EMI break up starts to impact on the classic catalogue, and the first projects from the various new owners of the licensing rights are set see the light of day. They do not have an easy job as EMI by and large treated the overall core albums with a degree of detail which was the envy of fans of many other bands (it’s taken Led Zeppelin 15 years to catch up!). On one side we have Universal shaping up with their Made In Japan project, a full set featuring all the recordings in correct order. On the other Warners Europe are developing a project based around the Mk 1 catalogue. Plans are also afoot for the two labels to co-ordinate so fans don’t get a glut of releases all at the same time, which makes a lot of sense (especially if you remember the unseemly scramble around the time of the reunion with everyone trying to get something on the shelves). 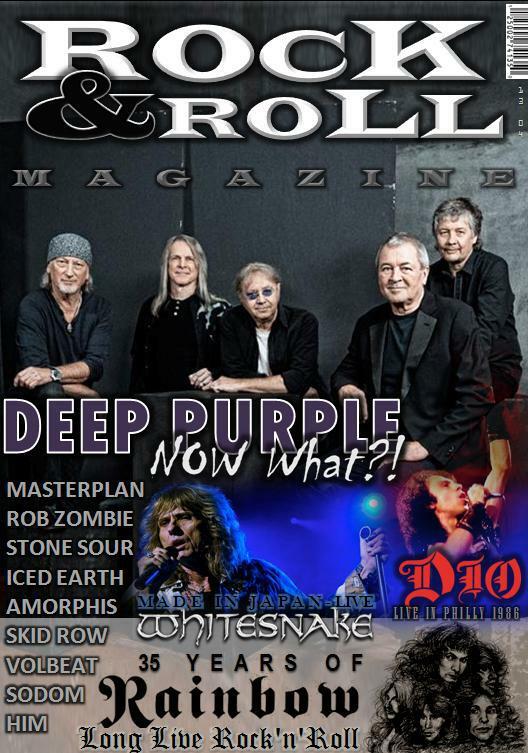 In the meantime, certain Deep Purple CDs are being marked up as ‘restricted trade’ and unavailable, though we assume the stock will be freed up before long. On the Jon Lord scene, the countdown to the special Albert Hall memorial show in April is on. There are plans to record and film; I think this will be enough for me but lots of DTB folk have their tickets. I am also told the heritage plaque in Leicester on Jon’s house of birth is going to happen this year, and we will give out more details nearer the time. The Jon Lord photographic book is under way and promises an interesting collection of images (many never before seen) and possibly some previously unreleased music as well through a CD in the package. A number of Jon’s music scores are also being made available online for budding orchestras (and anyone who wants to have these open while playing the CDs) during 2014, including the 2010 Concerto For Group & Orchestra. The book scene looks to be quite busy. The Wait For The Ricochet book finally appears in January (I know, but the printers have shipped it to us this week, so they will start going out next), there’s a Gillan biography under way in Finland, a special Deep Purple photo book from the publishers of the California Jam opus, and a rather super Blackmore photo biography project from another publisher. More on all these as and when we’re allowed (I’ve had my knuckles rapped before for saying too much!). 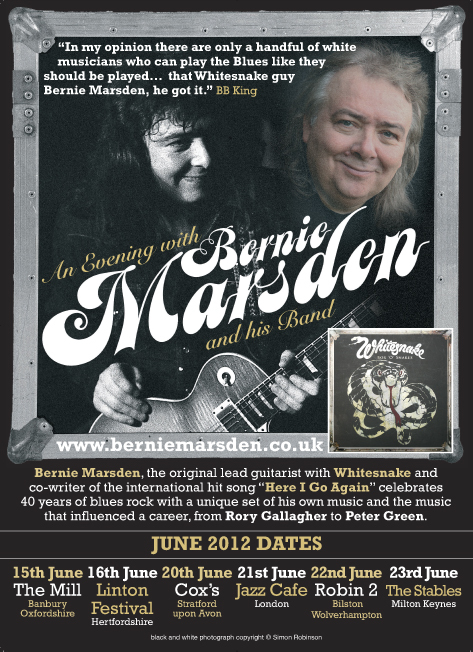 Musically we will see Bernie Marsden‘s new blues album around March, which promises to be quite a doozy from those who have heard advance copies, never mind Coverdale’s guesting on it. The label (which is owned by Joe Bonamassa) have pushed a taster up on their Soundcloud site, which we really liked. Given label backing which he’s not really had for a long time, this could really do well for Bernie. Check it out. David Coverdale also sings on a Whitesnake cover on an upcoming Adrian Vandenberg album, and talking of DC, expect something special from the man (and another man) later this year too. Glenn Hughes is bouncing back from the BCC close down with a new project which includes Jason Bonham and a young American multi-instrumentalist called Andrew Watt. Julian Lennon guests on one track. I’m told April is the planned arrival date for the CD. So, lots to look forward to and probably more besides; let us know if you have any news or info to share. We’d like to sneak in a thanks everyone who has been in touch or helped over the last twelve months and wish you all the best for 2104. Lots of nice comments on the site lately, I don’t usually publish these but they are appreciated. 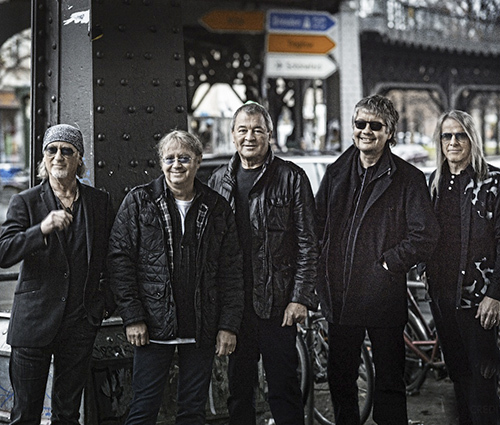 Updates on the new Deep Purple album, Glover’s comments, and press interviews on the site here. 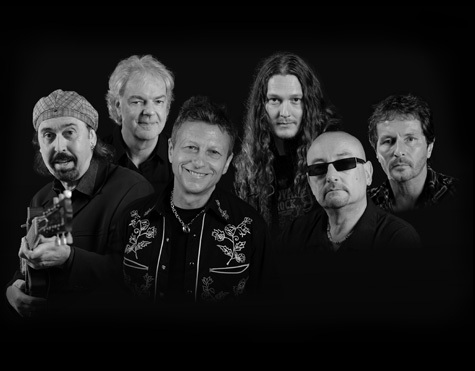 Deep Purple’s Speed King is being used (in a curiously edited version) as backing music for a new TV commercial in Norway, here’s the link if you want to take a peek. The company is LECA (Leca Lock). I don’t know which is the more bizarre, hearing the track used in such an incongruous way, or seeing an advert for breeze blocks on prime-time TV! Thanks to Bjørn Sund (and others) for the heads up. Meanwhile the DPO official approved series no. 2 reissues Denmark 72 in April. Lots of people wishing RB happy 68th the other day, in the meantime there is news of a new album from Blackmore’s Night, Dancer And The Moon, including a track dedicated to Jon and a Uriah Heep cover, on the site here. 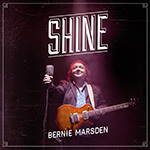 The two Bernie Marsden 80s solo albums have been reissued for the first time in ages. There are details on the site in the review section listing all the guests. They lack the bonus tracks from the Purple Records releases but as those have been out of print for several years these will fill a gap. 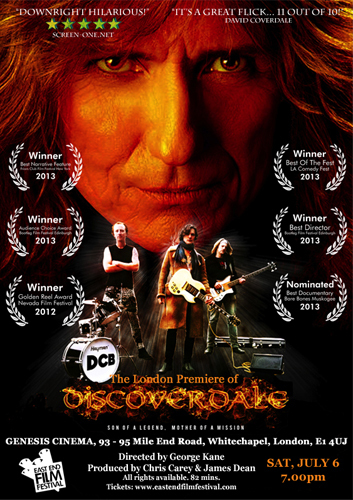 The film Discoverdale has been shown at the Bootleg Film Festival in Edinburgh last weekend and picked up Best Director and Audience Choice Awards. Really looking forward to seeing this! Thanks also to Trace Keane for the magazine cover, David Browne, Peter Judd, Tim Summers.